The rhythm of intaking more books, more words of life and Truth is high on my list for this year of abundance. Though my days may be short on hours to read, they’re full of hours to listen. So with a renewed Audible membership and a growing “wish list” it was time to put traction to this goal. In my true indecisive fashion, I agonized over which read to choose for January. 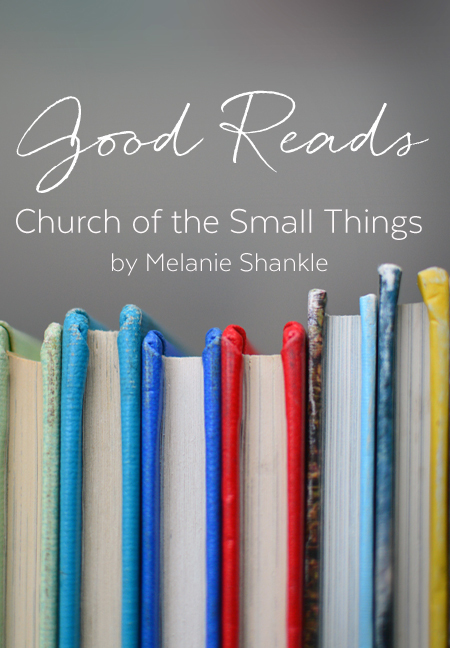 Gracious did God lead me well when He brought me back to Church of the Small Things by Melanie Shankle. I laughed and cried and laugh-cried my way through each chapter. I highly recommend the audio version of this book. Melanie’s Southern soul pours out even more so through each chapter as she narrates Church of the Small Things. For this Southern gal this brought this message deeper into my heart where it will really take root. I spent a lot of years striving toward, seeking out and counting down to the big moments of life - the milestone moments. What God taught me in my last decade though is it really is those small, almost mundane, moments woven together that create the foundation of life. This book was the perfect starting point for posturing my heart to reclaim abundance in the midst of the mundane. I walk into this year of abundance with the eyes of my heart enlightened by Melanie’s words. Melanie takes you by the hand through story and scripture to walk you faithfully into the depths of understanding God’s will for your joy in the midst of small things. I’m a girl who realized around age 26 she’d spent the better half of her twenties striving to meet the expectations of others. While those expectations were good things in the grand scheme of things they weren’t necessarily God’s will for my life. It wasn’t until this revelation that I fully surrendered my expectations and life plans to God. Wouldn’t you know, it was after that step of surrender God revealed to me just how magical my life already was right where He had me. This is it, friends. The overarching mission in this year of abundance. Our God is a backwards God; and upside-down Kingdom kind of God. And in His Kingdom simple, seemingly small or ordinary, are just the daily acts of obedience done in great love are just was we’ve been commissioned to do with our lives. This book is for you if you’re looking for a little (a lot of) laughter, a shift in perspective and the opportunity to understand God’s delight in the church of small things. I adore this intro to the book plus you'll understand why I loved hearing Melanie narrate this book. You can purchase Church of the Small Things anywhere books are sold, but if you're expecting a birthday or Christmas gift from me this year you can expect to receive this book.